ATLANTA (AP) — Nicki Collen still has vivid memories of facing the Atlanta Dream late last season. She’s blunt in her assessment. “Quite frankly, they laid down against us,” said Collen, who watched that game as a Connecticut Sun assistant coach. Collen is now coaching the Dream , who have put their dismal 2017 campaign firmly in their rear-view mirror. Atlanta (19-10) is one of the league’s hottest teams, winning 11 of its last 12 games and clinching a playoff berth with a victory Tuesday night over the Las Vegas Aces. A year ago, Atlanta stumbled to a nine-game losing streak and finished 12-22 — its worst mark since going 4-30 as an expansion team in 2008. Toward the end of that long skid, the Dream were blown out on their home court by Connecticut, 96-75. Collen saw a team in turmoil, but she also recognized the potential for a major turnaround. When the Dream fired Michael Cooper and offered her a head coaching job for the first time in her career, Collen jumped at the chance. Collen’s most notable move was persuading Angel McCoughtry to come back from a one-year sabbatical. A perennial All-Star who led Atlanta in scoring seven years in row, the enigmatic player wasn’t sure if she wanted to return to the Dream. But she had a long relationship with Collen, who recruited her at Louisville. They talked about how McCoughtry’s legacy. For those on the outside, McCoughtry’s return is the most obvious reason for Atlanta’s improvement. Indeed, Collen inherited a group with plenty of athletic ability but no sense of a coherent offensive system. The Dream could beat you on the fast break or create shots with the shot clock winding down. In between, they were a mess. The team signed Jessica Breland and Renee Montgomery as free agents. Monique Billings was drafted in the second round with a pick acquired for Bria Holmes, who is sitting our this season to have child. Alex Bentley was acquired last month in a trade with Collen’s former team. Collen needed a while to blend the newcomers with returning players Williams, Tiffany Hayes and Brittney Sykes. The Dream lost nine of their first 17 games. McCoughtry quickly reclaimed her place as one of the league’s top players, making the All-Star Game for the fifth time, but she’s got plenty of help. Nine players are averaging at least 5.0 points a game — depth that certainly came in handy during the victory over Las Vegas. 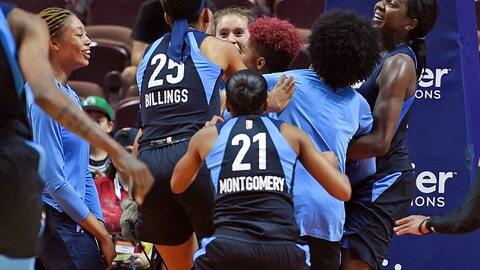 McCoughtry sustained a left knee injury with 5 1/2 minutes remaining and the Dream trailing by a point. She watched the rest of the game from bench, a towel draped over her shoulders, but her teammates finished on a 16-6 run for a 109-100 triumph. Williams scored a season-high 22 points. Bentley came off the bench to score 22, also a season high. In all, five players reached double figures. With five games left in the regular season, Atlanta is focused on locking down the No. 2 seed behind league-leading Seattle (23-7). That’s especially important in the WNBA’s eight-team playoff structure, since the top two teams earn byes for two single-elimination rounds before joining the fray in the best-of-five semifinals. The Dream can take a big step toward their goal of finishing second when they host the Los Angeles Sparks, one of the chasing teams, on Thursday night. McCoughtry is doubtful for the game, even though her knee injury isn’t believed to be serious. Collen is confident that others will step up if the star player needs a game or two to recover. Once the playoffs begin, the Dream will have their sights on the franchise’s first WNBA championship. Atlanta has reached the finals three times, only to get swept on each occasion.